With the name Havana, I always thought this restaurant featured solely Cuban cuisine. Once I saw the menu, I was intrigued by the variety of Latin American options they offered. Located in River North area, you can expect the restaurant to be busy, but you will be happy to find non-River North prices. The cost is somehow kept on the low side, while still offering above average food. My favorite is their jibarito... a Puerto Rican specialty sandwich that utilizes plantains rather than bread. Other options are hit or miss and the consistency between dishes follows the same trend. One constant favorite though is their mojito. They offer several flavors including tropical fruits like mango and guava. I highly suggest ordering a pitcher for the table... it is enough for five glasses and is a bargain. After high consideration, the slow service and lack of consistency between dishes forced me into giving Havana a 3.5-mile rating. At one point, the mojito itself was worth a 5-mile rating... but the rating went slowly down hill after the meal was begun. The first decision we all made was to share the calamari appetizer. I mean, who doesn't love fried calamari? Here, they lightly bread the squid and include a mixture of Latin spices. It is served with a combination chipotle-guajillo dipping sauce. The calamari itself was tender, and the crust was nice and crispy. It wasn't too thick and had enough spice for the calamari to stand alone. My favorite pieces were the tentacles because of how crispy they turned out. In terms of the sauce, I enjoyed them but thought the red portion was a little too acidic. The creamy portion was much better, but when mixed in the same container, it was difficult to separate. I think using a chimichurri sauce would be a great choice to serve alongside the creamy dip. Good, not great, but great for sharing. Another easy sharing appetizer was the chips and guacamole. We ordered the large and it came with a lot more than guacamole. The appetizer came with tri-colored tortilla chips, a large cup of guacamole, a fresh pico, and, what they call, a salse de arbol. The chips were nothing special except different colors. What stood out were those three dips. The guacamole was creamy and rich... probably helped out by the addition of a little sour cream. The pico was as fresh as can be. And, that salsa de arbol had some heat behind it. I enjoyed mixing the guac with the salsa de arbol to make a spicier guac. Easy for sharing and plenty of chips for all. I am a huge fan of fried plantains (as you will soon see below). So, our family decided to order the tostones appetizer. This dish is simple... green plantains fried twice and served with both a garlic dip and a house-made mojo sauce. 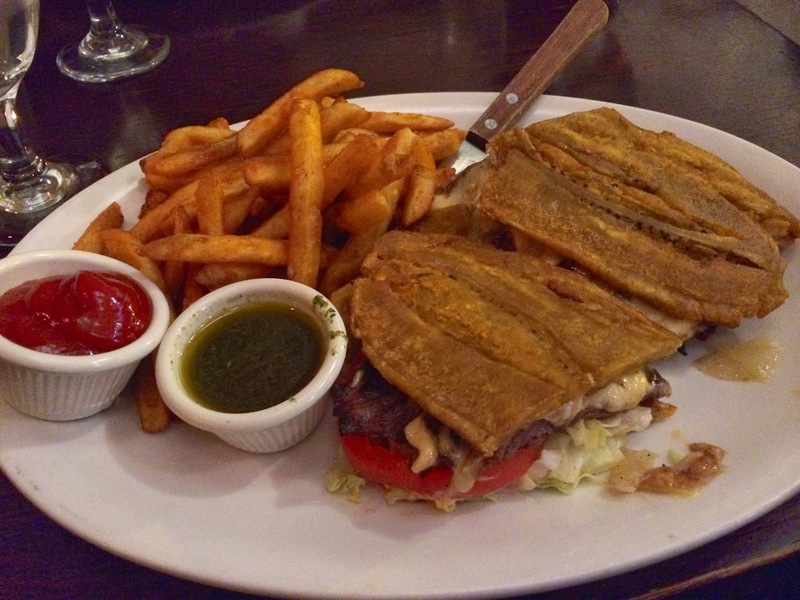 Each plantain was pounded to a thick patty before being fried to a crisp. They remained unseasoned, which I thought was unfortunate... they needed a little salt. However, both the garlic dip and that green mojo added enough flavor to the dish. The mojo was my favorite... it was made with a lemon and cilantro and had a little vinegar flavor to me. Mediocre dish by itself, but that mojo elevated it to better than average. As previously mentioned, fried plantains are my weakness. So, the steak jibarito was a no-brainer. This sandwich has always been one of my favorites, and Havana does a pretty good job making it. The sandwich starts with two twice-fried green plantains rather than bread. Stuffed inside are slices of marinated steak, melted American cheese, lettuce, tomatoes, onion, and of course a little mayo. The dish comes with seasoned fries and a chimichurri dipping sauce. I absolutely loved the sandwich. The plantains were thick enough to hold up against all the juices and sauces in the sandwich. As before, they were under seasoned, but once again, the dish was saved by the amazing chimichurri sauce. My steak was tender, but my mom also ordered the same sandwich and was greeted by an unfortunately tough piece of meat. I guess consistency isn't their forte. The fries were great, especially when you dip them in the chimichurri. It added the needed oil, cilantro, and garlic to the dish. Delicious... if you get the tender steak! The other dish my girlfriend and I decided to split was their version of a shrimp salad. It was a great compliment to the more greasy jibarito. 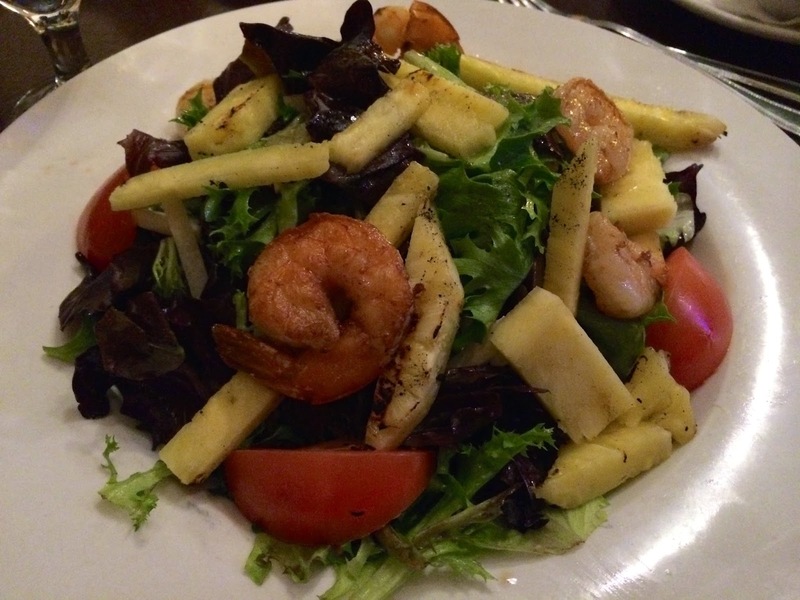 The salad is simple... mixed greens, grilled pineapple, sliced jicama, and of course grilled tiger shrimp. It was all topped with a citrus-guava dressing. I really enjoyed the sweetness of the salad. Not only was the dressing sweet, the pineapple and even jicama had some sugar component. It came with half a dozen shrimp that were of good size and cooked well. I was also pleasantly surprised to how large the salad was. Easily split between two people. My older brother chose the carne con tequila. This was one of the other options that sounded great so I was glad to give it a try. 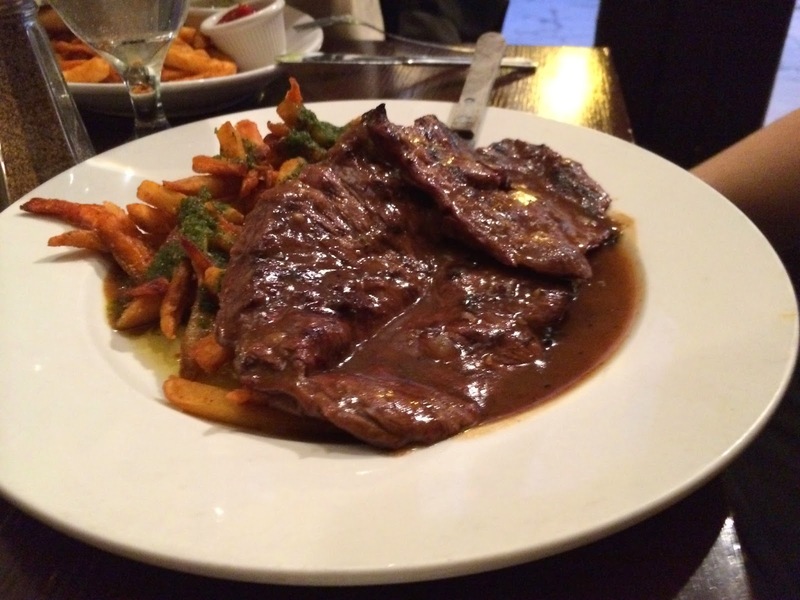 The dish was a chargrilled skirt steak smothered in a tequila-infused sauce and served with chimichurri topped fries. Once again, the dish was of great portions. The steak was much more tender than the one served in the jibarito. The sauce was amazing... reminded me of a gravy with a little hint of alcohol. I think the dish would have benefited from something that could soak up that gravy or even a vegetable dish to make it a little more fresh and less oily. And, finally, those chimichurri fries were still once again great. For the dessert, my family decided to split two slices. The first was key lime pie. Classic key lime flavor with house made whipped cream and a graham cracker crust. The majority of the key lime flavor was in that light green syrup drizzled on top with the rest of the dessert one-noted, and it wasn't a good note. The second dessert was a guava cheese flan. It sounded tasty, especially after the amazing guava mojito we all enjoyed... however, it was subpar just like the key lime pie. First of all, the constancy of the flan was more of a rubbery jello than a creamy flan. The cream cheese made it feel like a cheesecake, but also not creamy enough. Guava flavor was also minimal, unlike that mojito. I suggest avoiding dessert and getting another pitcher of that mojito. - Do order a pitcher of their Mojitos. I highly suggest the guava one. Sorry for no picture, but it was gone before I remembered. Delicious! - I wouldn't waste time on their dessert. It isn't that great and the wait staff took nearly 30 minutes to bring it out. Don't expect the fastest service. In fact, at one point, we went nearly 45 minutes without seeing our waiter. Service is just mediocre.